Spring has Sprung! Has your Nutrition? Spring has sprung and we are beginning to see mother nature wow us with bright colors of the new season. Reds, oranges, greens, purples, all vibrant and healthy. Why shouldn’t your dinner plate be the same? Different colored foods contain different nutrients to fuel our beautiful bodies in different ways. found to fight high blood pressure and combat cancer. Healthy red foods include beets, tomatoes, and red bell peppers. Often rich in Vitamin C, combats cancer, and can actually make skin appear more tan due to high amounts of Carotene. Healthy orange foods include oranges, carrots, sweet potato, and pumpkin. Nutrient powerhouses! Found to reduce blood pressure, fiber rich, and can combat cancer. Green foods include dark leafy greens such as spinach, chard, and kale, avocados, and kiwi fruits. Rich in antioxidants and combats cancer. Purple foods include berries and eggplant. 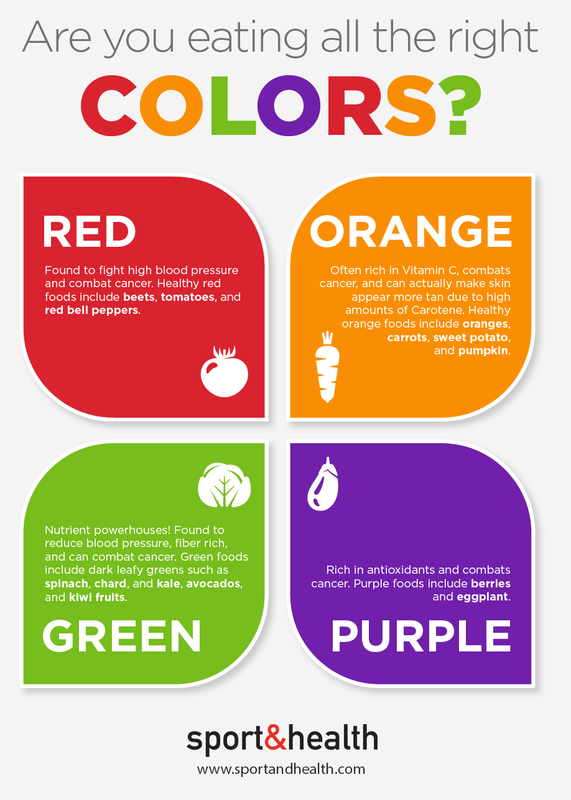 Each color food offers outstanding health benefits and they ALL combat cancer. Lets look at your plate. Do we see vibrant and healthy food or food that is bland and lacking nutrients? When you are planning your next meal, remember to eat your colors! Try "Perimeter Shopping" for fresh food. Unless you have been under a rock, you have most likely at some point heard of perimeter shopping at your local grocery store. What does this mean exactly and is it something you should consider? Perhaps! Perimeter shopping refers to the method of grocery shopping where the consumer shops the outer perimeter of the store and avoids the innermost section. The theory is that most stores keep their fresh produce, refrigerated, and frozen sections on the “perimeter” of their stores. If one was to shop ONLY the perimeter, they would be less likely to encounter packaged, processed, often high in sugar goodies usually located in the center isles. While some stores are laid out differently and most deli’s offer amazing looking desserts on every corner, perimeter shopping can help people cut down on the amount of processed foods they consume and purchase more fresh, nutrient dense foods. Foods such as fruits, vegetables, whole grains, dairy, lean meat, fish, poultry, beans, and nuts should fill your cart (or buggy if you’re from my neck of the woods) which are all typically located on the perimeter of grocery stores. If you or someone in your household has love for Little Debbie (I know she’s quite the looker!) just don’t go there! Stay away! If you do not buy it, it will not be in your house, and you will not consume it. It’s time to dump Little Debbie! She will understand! Need more customized nutrition solutions? Talk to a personal trainer!